Wacom today announced the Bamboo Sketch, a new precision stylus for drawing and sketching on both iPad and iPhone devices through a Bluetooth connection. The company said that the stylus mimics a traditional pen-and-paper writing and drawing experience thanks to two customizable shortcut buttons and two interchangeable pen nibs, in both soft and firm. The Bamboo Sketch can be used within apps like Bamboo Paper, ArtRage, Autodesk SketchBook, Concepts, and MediaBang Paint, and when it's in use the stylus boasts 2,048 levels of pressure sensitivity. To charge the stylus, users will be able to connect the magnetic charging port on the pen to a USB dongle accessory, which can be plugged into any traditional USB 3.0 port. The company said that the Bamboo Sketch stylus can last for up to 15 hours on one charge. 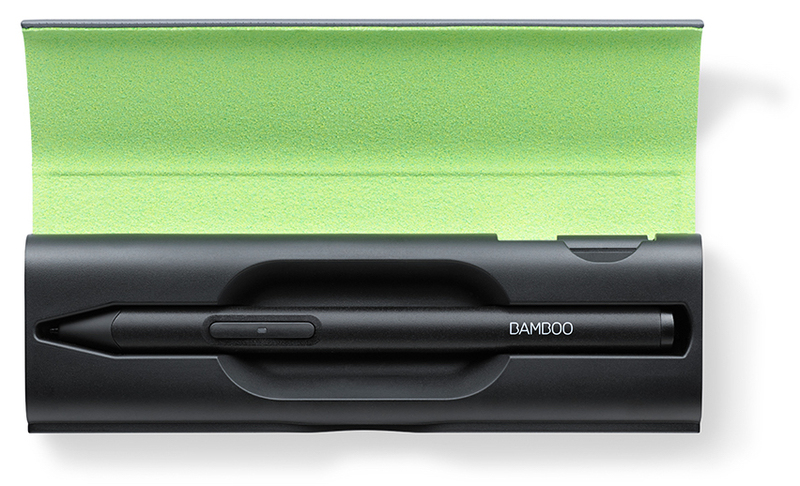 The stylus comes with a carrying case that holds the Bamboo Sketch, two pen nibs, and the USB charger. Wacom said that the Bamboo Sketch will launch online and in select retailers at a price point of $79.95 beginning in June. These solutions are crap. I've been fooled once by bamboo. Never again. Only advantage I see is that this will work with non-Pro iPads. Otherwise, if you own an iPad Pro, get the Apple Pencil. I don't have an iPad Pro, but based on experience, I would rather spend the $$$ on an iPad Pro than getting cheap headaches for trying to cut corners. When will companies stop wasting R&D money on these products? They will never be able to compete with the Pencil. I wish they could, but the last 7 years have shown otherwise. Pencil should eventually be made to support the iPhones, especially the iPhone Plus (which many have opted for in place of a tablet/iPad). In fact, if Apple wants to see a resurgence in iPad sales, it should also encompass support for all iPads, not just the Pro. Yes, I understand that. I should have been more clear that I was implying (Pencil compatibility) with all future iPads… if Apple ever wants to see a resurgence in iPad sales again. Everyone knows the tablet market has been declining lately. And as I've chimed in the past, adding a bundled Pencil/iPad Pro package could spur additional sales. Understanding it won't be a huge discount (this is Apple after all), but even a $25 savings won't hurt Apple's margins. It will make the Pencil an automatic buy vs maybe later. And it will grow stylus adoption from both developers and users. Agree that first party solutions win, but these third party offerings fill a void and Wacom's are probably the least worst. Wacom has been losing money of late, so of course they're going to try and exploit this market until such time as Apple brings Pencil support to its full range of devices. I bought an early pressure sensitive stylus for iPad that was crowdfunded. A valiant attempt, I knew it wasn't for me within minutes of using it. My Cintiq Companion 2 is my only device apart from my phone and the drawing experience equals or betters Apple Pencil. But it's also heavy, noisy and has poor battery life. Native Mac drawing tablet functionality in iOS 11 would be fantastic, but I can't see it happening when Apple is so vehemently opposed to touching macOS directly. Hope I'm proved wrong. As for phones, the Galaxy Note line has a Wacom digitiser built in and it's very responsive. It would be great if Apple offered a smaller version of the Pencil to work with iPhone. On a side note, IAF (Initial Activation Force) is more important for artists than pressure sensitivity. Both Wacom EMR devices (Cintiq/Intuos/Galaxy Note) and Apple's Pencil have an IAF of about 1 gram. This is what makes them so responsive: they pick up your lightest strokes. In contrast, the latest Surface Pen has an IAF of around 9 grams. An improvement on the last generation but still not good enough for me. First party solutions will always win out because they designed the hardware to work together. If the new iPad Pro or iOS 11 update adds Mac drawing tablet functionality, as rumored, it will eat their lunch when it comes to their smaller tablets. Apple would be raking it in if they included the Pencil with each iPad, just from selling replacement Pencils to people who have lost theirs. I always thought that was their plan from the get go, considering the lack of onboard Pencil storage. Stylus predate the iPad. But until the iPad Pro and Pencil, there was no way for the stylus to communicate the pressure to the device. With a system as closed as iOS, they have to wait for Apple to add that support or build that support in the apps (which means the stylus only works with specific apps. But that would also drive up the cost of entry. Maybe. Perhaps they are taking this sector more seriously with the iPad taking sales from their Cintiq line? It doesn't matter what Wacom does on their end, the iPad Pro has extra hardware to make the Pencil experience work the way it does - high accuracy and low latency. Unless Wacom can tap into that, this thing will not perform substantially better than any other similar stylus ever released, and they don't perform well. It's an inherent limitation of utilizing the capacitive touch screen.